The travel company has had a run of misfortune in the Middle East this year. Although accidents, natural disasters and geopolitical rumblings are hazards of the job, so to speak, for a holiday company, you can’t deny Thomas Cook has had a pretty bad run of luck recently. The company has cancelled all flights and holidays to Sharm el-Sheikh until November 12th, after the UK government grounded flights to the Egyptian resort today. Foreign secretary Philip Hammond said intelligence suggested there was a ‘significant possibility’ an on-board bomb caused a Russian plane flying from Sharm to crash on Saturday, killing 224 people. A US official told AP news agency their ‘tentative conclusion’ was that an affiliate of IS in the Sinai Peninsula had planted the device. 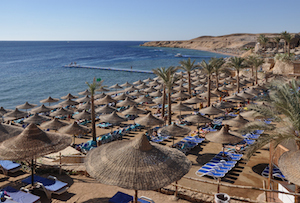 Sharm has been a sun, sea ‘n’ sand oasis in the midst of Middle Eastern turbulence, but, even though the Foreign Office isn’t changing its travel advice for the resort itself, clearly even it isn’t immune to the instability rocking the region. Hammond said he thought it would only take a day for ‘short-term emergency measures’ to be put in place at the resort’s airport. Nonetheless, Thomas Cook and Tui Group-owned Thomson Airways and First Choice weren’t taking any chances – and wanted to provte that to customers - by cancelling flights until next week. Thomas Cook’s shares fell more than 5% to around 114p this morning, as investors digested yet another bout of bad news. Tui Group’s dropped around 1.7% to 1,140p. British Airways owner IAG and easyJet, on the other hand, which only cancelled flights today, saw their shares rise 1.1% and almost 2% respectively. It’s been a pretty turbulent ride on the stock markets for Thomas Cook this year. The Russian plane crash comes after a terror attack killed 38 people on a Tunisian beach in June, 33 of whom were on Tui holidays. Tui said that tragedy would cost them around €40m (£28m), while Thomas Cook estimated it would hit full-year profits by £25m. Thomas Cook has of course had a turbulent year for reasons of its own making as well, from dramatically firing marmite chief executive Harriet Green last November, to mishandling the deaths of two children on one of its holidays nine years ago. Given the unpalatable choice, it would probably rather deal with a disaster not of its own making.